Miners trapped deep underground in Chile have been contacted by four survivors of a famous 1972 plane crash in the Andes mountains. Speaking to the 33 miners on video link, the four Uruguayan survivors said they brought a message of hope to the miners and their families. They were among a group of 16 who endured extreme conditions for 72 days before being rescued in Chile. The miners have now been stuck 2,300ft (700m) underground for a month. They must now wait two to four months for engineers to drill an escape shaft. 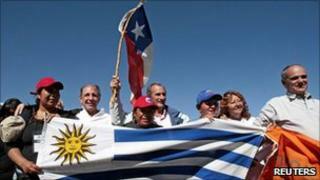 The Uruguayan survivors met relatives of the trapped miners at the San Jose mine before speaking to the miners via video. They said they had come to show their solidarity with the miners, as well as to express their thanks to Chile for rescuing them 38 years ago. And they said they were confident the miners would come out alive. "In the same way we were able to get off the mountain and lead normal lives, they too will get out and lead fantastic lives," said Pedro Algorta, one of the plane crash survivors. "Look at us, 38 years after we crashed, 16 of us who were rescued are still alive. It is proof that man can survive the most difficult situations and they will survive. The worst is already over. " The four Uruguayans were flying to the Chilean capital Santiago in 1972 to play a rugby match when their plane crashed high in the Andes mountains. Twelve of the 45 people on board died in the crash and 17 died later. But 16 survived for 72 days lost in the snow at 9,800ft (3000m) above sea level before two walked out and found help. Some of them were forced to eat the flesh of their dead companions to stay alive. Their ordeal inspired a best-selling book and the 1993 Hollywood film, "Alive." Relatives of the miners welcomed their gesture of support. "They fought so hard to save their lives," said Maria Segovia, sister of the trapped miner Dario Segovia. "Seeing them makes my heart so happy." The operation to drill a rescue shaft at the mine, near Copiapo, has penetrated more than 40m (130ft) deep since it began on Monday. Meanwhile, two alternative rescue plans are in progress, according to Andres Sougarret, the engineer in charge of the rescue. A second, faster drill that could aid the men's rescue arrived at the site on Friday and could begin work on Sunday, said Mr Sougarret. The T-130 excavator will be deployed initially to enlarge the supply chute to allow larger objects to be sent down to the 33 men. "What's more, we've got a third plan, called plan C, consisting of an oil drilling machine that will require a platform the size of a football pitch," said Mr Sougarret. "It will be working before 18 September (Chile's Independence Day)." Have Your Say: How would you survive being trapped?